Cancer Epidemiology represents the study of factors responsible for the initiation, metastasis and prognosis of various types of cancer. Epidemiological research findings on cancer can facilitate the formulation of suitable therapeutic treatment methods and preventive medicines for cancer. Journal of Cancer Epidemiology & Prevention is a peer reviewed scholarly journal that focuses on the publication of research findings on the role of carcinogens and oncogenes in the manifestation of cancer. Manuscripts showcasing the adept cancer vaccines and their effectiveness in the prevention of cancer are solicited. The scope of the journal includes cancer etiology, health disparities associated with cancer, screening and detection of cancers at an early stage with the help of biomarkers, cancer development and control and surveillance. 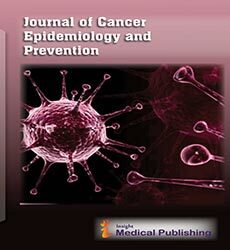 The Journal of Cancer Epidemiology & Prevention also publishes novel findings in occupational epidemiology as well as genetic and molecular epidemiology of cancer including environmental carcinogens, gene-environment interactions and cancer risk prediction. The Journal accepts original research article, review article, short communication, case report, letter-to-the-Editor and Editorials for publication in an open access platform. All the published articles can be accessed online without any subscription charges and will receive the benefit of extensive worldwide visibility. Article processing will be done through the Editorial Manager System which helps in maintaining the quality of the peer review process and provides easy access to the authors to track the process of manuscript evaluation and publication in an automated way. All the submitted manuscripts undergo peer review by the subject matter experts under the supervision of the Editor-in-Chief or assigned Editorial committee member of the Journal of Cancer Epidemiology and Prevention. Approval of at least two independent reviewers and the editor is mandatory for the acceptance of the manuscript for publication. A biomarker may be a biological molecule found in blood, other body fluids, or tissues that is a sign of a normal or abnormal process, or of a condition or disease. It can be used to see how well the body responds to a treatment for a disease or condition. Biomarkers of cancer include nucleic acids, proteins, sugars, lipids, and small metabolites, cytogenetic and cytokinetic parameters as well as whole tumor cells found in the body fluid. Genetic, epigenetic, proteomic, glycomic, and imaging biomarkers can be used for cancer diagnosis, prognosis, and epidemiology. Cancer control can be done by reducing the number of cancer cases and deaths and improving quality of life of cancer patients, through the systematic and equitable implementation of evidence-based strategies for prevention, early detection, diagnosis, treatment, and palliation, making the best use of available resources. The fundamental abnormality resulting in the development of cancer is the continual unregulated proliferation of cancer cells. Cancer cells grow and divide in an uncontrolled manner rather than responding appropriately to the signals that control normal cell behavior, invading normal tissues and organs and eventually spreading throughout the body. Etiology is the study of causation, or origination. Cancer is neither contagious nor hereditary disease. It is suggested that every living organism has some inactive cancer-causing genes called proto-oncogenes. A number of physical, chemical or biological agents are known to mutate and activate these proto-oncogenes into active and cancer causing oncogenes. Due to altered gene activity, normal control mechanism is lost and the abnormal cell growth and cell division take place. Cancer can be caused by radiations, physical irritants and chemical or biological agents. The National Cancer Institute (NCI) defines "cancer health disparities" as adverse differences in cancer incidence (new cases), cancer prevalence (all existing cases), cancer death (mortality), cancer survivorship, and burden of cancer or related health conditions that exist among specific population groups in the United States. These population groups may be characterized by age, disability, education, ethnicity, gender, geographic location, income, or race. People who are poor, lack health insurance, and are medically underserved (have limited or no access to effective health care)-regardless of ethnic and racial background-often bear a greater burden of disease than the general population. A cancer incidence rate is the number of new cancers of a specific site/type occurring in a specified population during a year, usually expressed as the number of cancers per 100,000 population at risk. Cancer mortality is usually expressed as the number of deaths due to cancer per 100,000 population. Cancer pharmacology plays a key role in drug development in cancer. It has adapted to the changing face of drug development by establishing experimental models and target orientated approaches. In silico approach ha helped to develop the field of cancer pharmacology. Cancer prediction models provide an important approach to assessing risk and prognosis by identifying individuals at high risk, facilitating the design and planning of clinical cancer trials, fostering the development of benefit-risk indices, and enabling estimates of the population burden and cost of cancer. Models also may aid in the evaluation of treatments and interventions. Checking for cancer (or for conditions that may become cancer) in people who have no symptoms is called screening. Regular screening for cancer detection is important to reduce the chance of dying with cancer. Cancer surveillance is the ongoing, timely, and systematic collection and analysis of information on new cancer cases, extent of disease, screening tests, treatment, survival, and cancer deaths. Cancer chemoprevention is the use of chemical substances to stop or keep cancer from developing. These substances may be natural, made in a laboratory, or taken from a living source. Chemoprevention is typically used by people who have a higher risk of developing cancer. People with a higher risk of cancer include those with an inherited cancer syndrome or a family history of cancer. It is also used to prevent relapsing of a cancer. Cancer Molecular epidemiology is a branch of oncology and epidemiology that focuses on the contribution of potential environmental and genetic risk factors, identified at the molecular level, to the etiology, distribution and prevention of cancer within families and across populations. The goal of molecular epidemiology is to supplement and integrate existing methods. Occupational epidemiology has been defined as the study of the effects of workplace exposures on the frequency and distribution of diseases and injuries in the population. The main objective of occupational epidemiology is prevention through identifying the consequences of workplace exposures on health. Prognosis of a cancer depends on many factors like person's medical history, type of cancer, stage of cancer, characteristics of the cancer, treatment chosen, response to treatment etc. The term "Five-year survival" is used while talking about cancer prognosis and survival.